Spike's VGX may no longer be this year's big holiday showcase—former host Geoff Keighley just announced plans for a new December awards show, The Game Awards, which promises "awards, world premieres, musical performances, and appearances by game developers, eSports players and online content creators." For the past few years, Keighley (a friend of Kotaku) has hosted the Spike VGAs, an annual awards show that was better known for its big exclusive announcements than its actual awards. In 2010, Keighley premiered The Elder Scrolls V: Skyrim, and last year's show gave us a first look at games like No Man's Sky and Tales From The Borderlands. Traditionally, the VGAs—rebranded the VGX in 2013—have been the December equivalent of E3, a place where major publishers can announce their biggest new games. 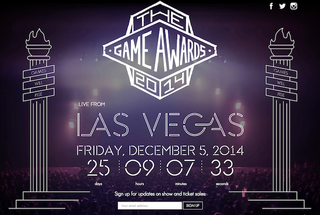 The Game Awards 2014 is produced by Geoff Keighley, with the guidance of an advisory board that includes Reggie Fils-Aime (President and COO, Nintendo of America), Yves Guillemot (CEO, Ubisoft), Hideo Kojima (President, Kojima Productions), Shawn Layden (CEO, Sony Computer Entertainment America), Peter Moore (COO, Electronic Arts), Rockstar Games, Phil Spencer (Head of Xbox, Microsoft), Martin Tremblay (President, Warner Bros. Interactive Entertainment) and Valve. Given all of that pedigree, it appears that this will be the show for announcements this December. The big hope, of course, is Fallout 4—a hope exacerbated by a Keighley tease last month that he was making plans with Bethesda's PR team. Spike has yet to announce whether they plan to put on another VGX show this year.